Collins started at both safety positions in college and was an All-Mid-Eastern Athletic Conference selection in 2004 when he intercepted 6 passes and was credited with 54 tackles. He was chosen by the Packers in the second round of the 2005 NFL draft and, with the departure of Darren Sharper due to contract issues, Collins moved directly into the starting lineup at free safety. With good speed and work ethic, he grew into the role and was credited with 84 tackles and two forced fumbles along with one interception. 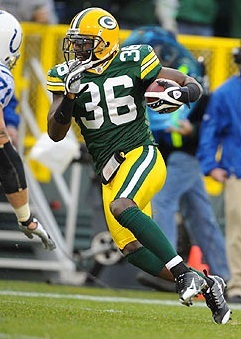 Collins picked off three passes in 2006, one of which he returned for a touchdown, and his play continued to improve. Packers went 6-10 to finish third in the NFC North while tying the Tampa Bay Buccaneers for the conference lead in interceptions (22). Collins followed up his outstanding 2008 season by gaining second-team All-NFL honors from the Associated Press as well as selection to the Pro Bowl in each of the next two years while intercepting a total of 10 passes. He also scored a TD on an interception return in the Super Bowl XLV win over Pittsburgh following the 2010 season. However, a serious neck injury suffered in the second week of 2011 not only ended his season but cut short his career. Overall, he started 95 games, all with the Packers, and intercepted 21 passes that he returned for 507 yards and four touchdowns. He was a three-time AP second-team All-NFL selection and was chosen for as many Pro Bowls.